Have you been enjoying your long weekend? 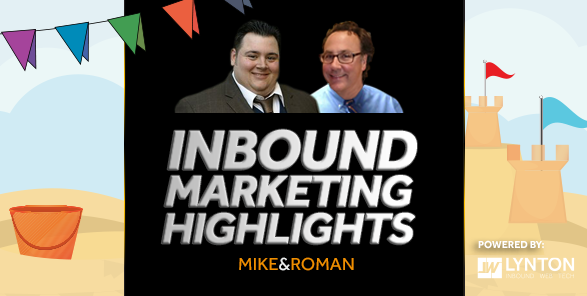 Well take the burgers off the grill and pop a beer it's time for Sunday's Inbound Marketing Highlights with Mike and Roman! Should your insurance agency be on Pinterest? Is it worth your time as a owner of a bakery shop to be on LinkedIn? For the first time in seven years Fortune 500 companies are blogging less, but they're spending more time on social. Can an unhappy customer or competitor harm your site through negative SEO? Here are a few of the many free tools out there that can you help you in so many areas, including writing blogs, new content and posts for social media sites. Dear , do you know how important it is to personalize the emails you send to your customers? Now, get back to that backyard barbecue and enjoy that last beach weekend before next Memorial Day!